Greenstuff Gretchin: INQ28 - Oldhammer style! Sometimes, when you're searching through your lead bits box (that one that has been around for about two decades now), you find those little diamonds that you completely forgot about and aren't entirely certain when it was you acquired them. Anyway, some of you may have noticed that I've been building the world of Glebe IV with a view for something playable in the future, so when I found this little diamond, things instantly clicked around a new (more militant) warband. 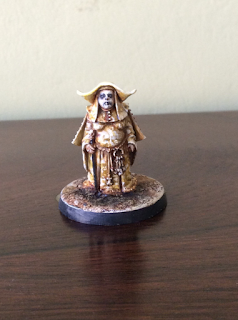 So, I discovered that this little diamond is a rather old Aly Morrison sculpt from the Citadel Miniatures AD&D range. Obviously she has a very 'classic witch hunter' look to her, so she is destined for the Ordo Hereticus. I planned to change her 'stop in the name of love' right hand/arm so that she is hold a pistol of some sort (to properly tie her into the 41st Millennium). The only unfortunate thing is that she is at 25mm rather than 28mm, meaning she is a tad on the small side, so I will probably put her on a base elevated with some kind of scenery. Actually, her petite-ness puts me in mind of John Blanche's very own Hilgardius. 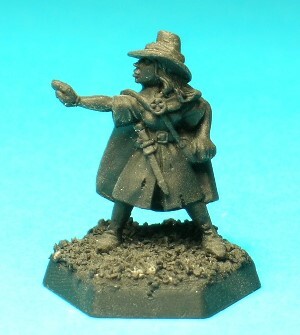 Now I must figure out what sort of weapon to give my female Solomon Kane! I always like to see old miniatures being brought out for modern applications. Giving her a firearm is a good idea, though I fear you might have to build a bunch of it our of plasticard and greenstuff, as nearly all of the 40k weaponry is tremendously oversized.